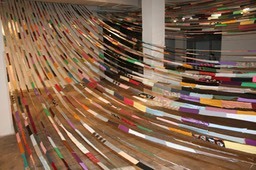 Inspired by the Hidirellez (spring) festival he attended during his time in Istanbul Mark created an a large installation ‘Ask’. To ask is to seek information, to make a request. 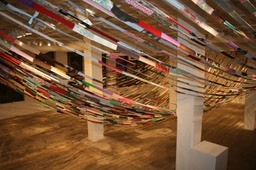 A one mile long continuous ribbon of color fabric wraps the gallery. 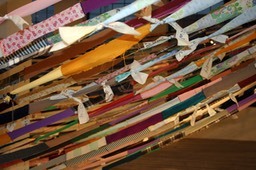 A stack of white fabric cut into tabs for viewers/participants to use to write down a wish or prayer or idea or dream or hope, an ASK of some sort. 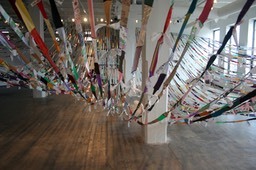 Participants tie their ASK to the curtain, eventually turning the surface of the curtain white with all the hopes and dreams of the community. This piece is based on a traditional springtime New Year festival I attended while Observer in Residence at Caravansarai in Istanbul. 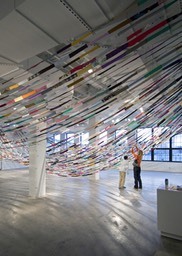 Hundreds of strings of tied fabric pieces were hung off the sides of buildings and people would tie their wishes to the curtain, marking the crawl out of winter and their hopes for the new year.